Return of the power pose? You may have noticed the BBC news article that showed a photo of Home Secretary Sajid Javid in a supposed ‘power pose’. People have suggested he was trying (and failing) to look commanding. Although reporters at the scene confessed he was not standing in that position (he was actually just mid-stride, turning to have his photo taken) this has sparked a debate about people using a wide stance in business and politics. If you want to be an authentic and effective speaker and leader you need to ask yourself, “How was I born to speak?” When you ask this question you get to the root cause of the power pose theory and discover simple truths that allow you to be a great communicator. Take a look at babies who are just learning to stand up. If they stand with their feet too close together they will fall over. The same happens if their feet are too wide. In contrast, if they put their feet shoulder-width apart they find their balance and stand tall. This same position is used by sports people around the world: tennis players preparing to move quickly in any direction; golf players who are steadying themselves for the perfect putt; basketball players readying their stance to shoot the game winning shot. Standing feet shoulder-width apart is a natural choice when you want to perform at your physical best. This is not a technique that you need to learn. It is the way you were born to stand. So where does the problem come from? During our lives we all build up habits, cultural conditioning and armour to help us survive the stress of daily situations at work. People limit their voices, minimise gestures and sit hunched at the table to avoid standing out. If you do this often enough the new pattern of behaviour will feel like ‘being yourself’ but it isn’t you. It’s a limited version of you. When you then attempt to stand and speak in a meeting you will find that you have lost touch with your natural instincts, feel awkward and struggle to be heard. Some politicians and business people seem to get poor advice on how to overcome these challenges and they end up looking forced and strained. Instead of removing poor habits they are just adding new ones. If you stand overly wide and tense you will clearly look strange (just check out the repeated Tory party images). In contrast, many people go the other way, standing with their feet together or leaning on one hip. These positions are inherently weaker, with gravity working against you rather than with you. You can find proof of this in a study conducted with UCL involving over 2000 people from Europe, Asia and America. This study tested how people of all ages and backgrounds react to different standing positions. 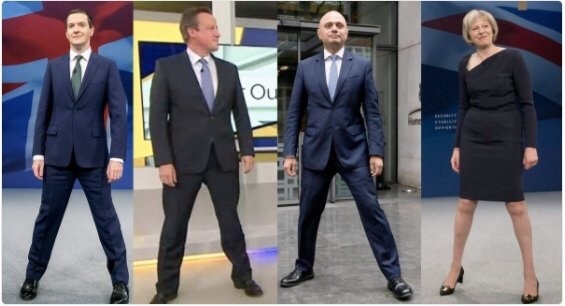 The evidence showed that people standing shoulder-width apart were 32% more likely to gain votes in an election compared to people who kept their feet together, when all other factors were kept the same. The study also showed that strong gestures were rated as more confident and inspiring compared to limp gestures or stillness. Again we can see the same bold gestures used by children, before they become self-conscious and start to limit their natural speaking skills. So in order to create a confident impression you don’t need to learn more habits. You need to strip away the old ones that are holding you back and release your full potential. When you express yourself in the way that you were born to speak people are more likely to enjoy watching and listening to you, helping you to gain the results and respect you deserve. If you would like to learn more contact us at hello@ukbodytalk.com to find out about our range of upcoming workshops and coaching options.